Here is a completed half sleeve on Andrew. He came in with a really loose idea so we had a long consultation and decided to go with a crane. 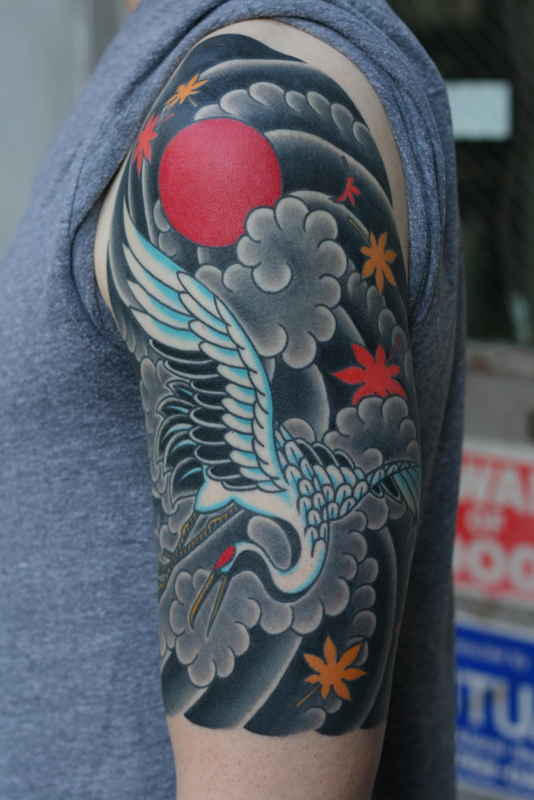 The longer I tattoo the more I really respect and admire Japanese tattooing. I think it takes a more refined and developed taste to want Japanese imagery, and it’s the best way to really cover some space. I always tell people if you just want one-shot tattoos, go traditional American, and if you want a whole sleeve done and look planned, get something Japanese. Hundreds of years of tattooing can’t be wrong. I would love to do more Japanese tattoos. Call NY Adorned (212-473-0007) or email brad@nyadorned.com for inquires. This entry was posted in Uncategorized and tagged brad stevens, brad stevens tattoo, crane tattoo, half sleeve tattoo, japanese crane tattoo, japanese tattoo, new york adorned, nyc tattoo. Bookmark the permalink.